What is the Debt Blaster? The Debt Blaster is an original budgeting idea I have developed to turbo-charge your existing debt payoff plan. 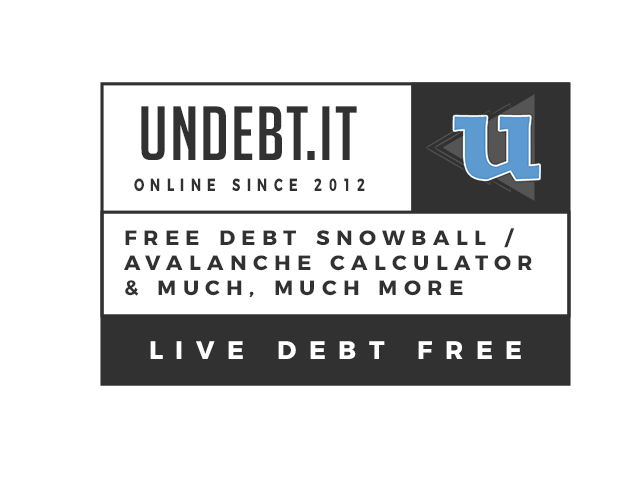 Exclusive to Undebt.it, the Debt Blaster option automatically increases your monthly budget in small increments and adjusts your payment plan accordingly. The Blaster works with any of the Undebt.it payment plans and gives you the option of increasing your budget by a fixed amount or by a percentage each month. To get going with the Blaster, you need to have an active Undebt.it+ account. There is a section in My Account > Main Settings where you control the Blaster options. The photo above shows the option that needs to be checked to turn on the Debt Blaster. Once the box is checked you'll be able to choose which increment method and amount you want to use. Don't forget to click the Save Changes button when you are done. The examples below are based off of a $1,400 monthly budget with a balance of approximately $50,000. There are also $1,000 debt snowflakes every 6 months which you can see on the projection graphs. The percentage amount compounds over time; for example, a $1,400 monthly budget set to a 1% increase would increase to $1,414 the first month, and by the sixth month the budget would be $1,486. The fixed amount option compounds the budget by the same amount each month. This example shows a $10 compounding increase every month. The graph above shows the projected payoff plan for the example $1,400/month account. The payoff date is scheduled to be September 2019. This graph shows the Debt Blaster option enabled with the 1% monthly increase. The new payoff date is May 2019, which saves approx. $476 in interest and gets you debt free a full 5 months sooner.